Broil King's economical Signet 90 offers 50 BTUs of cooking power in a three burner grilling system, plus a 10K BTU side burner and a rear rotissierie unit running at 15K. 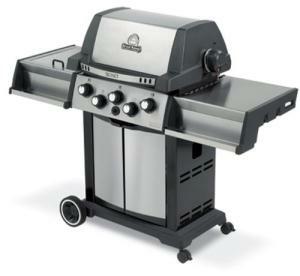 The design allows slow barbecue with or without the rotissierie in use, but the success of that will depend upon cooking skill and experience with the settings. Each burner is independently controlled and lights by dependable electronic ignition. The 400 square inch cooking grid is porcelain-coated cast iron. Be careful when cleaning the grid so you avoid damaging the porcelain layer. For slow cooking, the company recommends placing a pan of water on the Flav-R-Wave shield over one of the main burners, but that can be an awkward business, and taking it out before the grill cools is discouraged. Consider using the rotissierie instead. Side tables fold down for storage and lock securely in place during use. The grill hood and cabinet are a mix of stainless steel and cast aluminum, both of which are very durable. Broil King guarantees the structural parts for life, the burner tubes for five years (but under a pro-rated re-purchase system), and gives a two-year warranty on small parts. This unit does not offer a smoker option, and placing ceramic briquettes, containers of wood chips, or other home remedy solutions on the Flav-R-Wave system is not recommended. The Flav-R-Wave panels generate smoke by vaporizing meat juices that fall through the grid.